Cancer incidence and death rates in our region are above national averages and vary substantially by county. 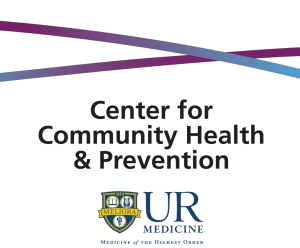 Clinicians and researchers at the Wilmot Cancer Institute (WCI) of the University of Rochester wanted to learn more about the prevalence of various cancers in our upstate region. This information helps WCI develop prevention efforts and treat cancers more effectively. County-level data from the New York State Cancer Registry (2011-2015) show higher incidence and death rates as compared to the Surveillance, Epidemiology, and End Results (SEER) program (2011-2015) national data for six cancers (breast, colorectal, lung/bronchus, cervix uteri, bladder, and Non-Hodgkin lymphomas). 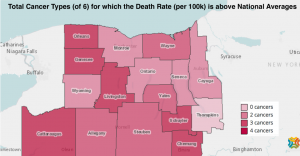 The maps above highlight the incidence and death rates across the six cancers, by county. While all the selected counties have at least one of these cancers’ incidence and mortality rates above national averages, the variability by county is striking, and provides WCI with information to help determine population health initiatives.